Home PAGASA Weather PAGASA Weather Update for today, 20 January 2018. PAGASA Weather Update for today, 20 January 2018. 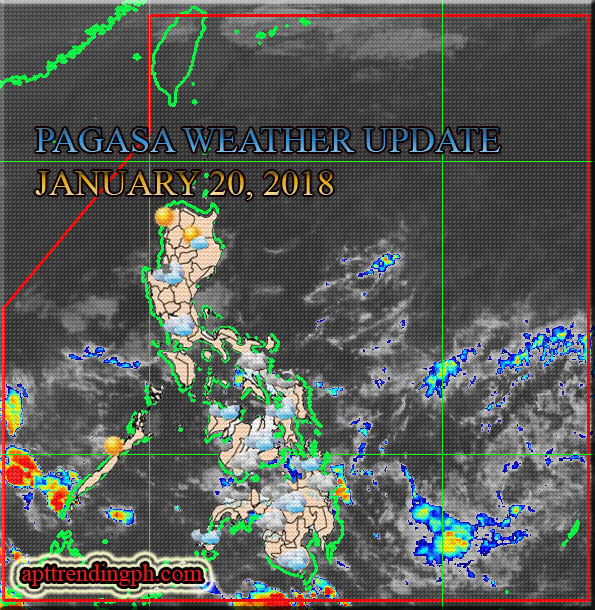 PAGASA: Philippine Weather Image Satellite as of January 20, 2018. (vis HIMAWARI Satellite plus Current Weather Condition map. Northeast Monsoon affecting Extreme Northern Luzon. Easterlies affecting the rest of the country issued 4:00 AM today, 20 January 2018. As of today, there is NO Low Pressure Area in Philippine area of responsibility and Gale warning update. Northeast Monsoon will bring Partly cloudy to cloudy skies with isolated rains in Batanes. Metro Manila and the rest of the country will experience Partly cloudy to cloudy skies with isolated rainshowers due to Localized Thunderstorm. Impacts: Possible flash floods or landslides due to light to moderatewith at times heavy rains.